The entire Parisian elite frequented the concerts here (Debussy, Duparc, d’Indy, Cortot, Albéniz, Fauré, Ysaÿe, Mallarmé, Gide, Monet, Rodin et al.). A touching photograph was taken in 1893 showing Debussy playing his Clair de Lune with Chausson looking on. At that time, French music was largely dominated by opera. Thanks to the stage provided by the SNM, French composers started to write chamber music again. 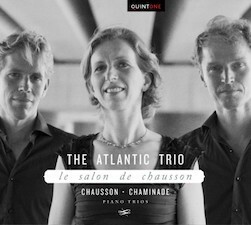 Many gems were created in this period; the two piano trios presented here are perfect examples. In spite of the remarkable similarities between these piano trios the pieces could not be more different in style.